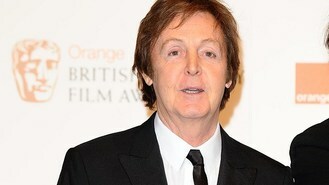 Sir Paul McCartney's track, which he recorded with his band Wings, topped a poll of BBC Radio 5 Live and Radio 2 listeners. The track, from the 1973 film of the same name, pulled in more than a quarter of the votes and provided the climax to the Queen's Diamond Jubilee concert in June. The winning track was unveiled by Mark Kermode and Simon Mayo during a Bond special of the film review show on 5 Live..
Carly Simon's Nobody Does It Better from The Spy Who Loved Me was runner-up, while Dame Shirley Bassey's Goldfinger came third. The top tunes were played by the BBC Philharmonic and will feature later on Friday Night Is Music Night: Bond and Beyond on Radio 2. The poll and the performances were to mark 50 years since 007 first appeared on cinema screens with Dr No.